I tried these strings looking for a 60’s vibe. Oh yeah, yeah, yeah. Takes me back into my Beatlemania days. I have these on 2 of the guitars in my guitarsenal. Not for the weak of finger. These string have a very dull, lifeless sound when played on an unplugged guitar and need to be electrified. I would recommend these for persons with single coil pickup guitars, since they will add some thickness to the otherwise thin sound that is produced by single coil pickups. Bending a 10 and even a 13 isn't that bad but bending a wound 19 is not so easy. The typical electric guitarist plays a 9- 16 on the treble end which is quite easy to bend, so if bending is your thing, don't bother with these strings. You will soon find out why the solos from the Sixties were so awful, especially when is came to bending. 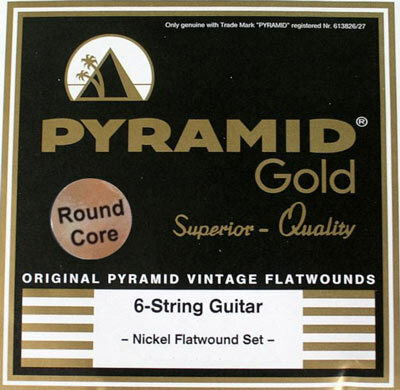 This is not to say you shouldn't explore round wound lighter gauge Pyramid strings, if bend is your thing. Overall they do have their own special tone, that is still very coveted. These are made like strings from the early 60's. I use them on a Jazzmaster to get a real surf tone. You have to be sure to make a sharp bend at the tuner end before installing. If you don't, the strings can unravel. Q: Would these strings work well on my EPIPHONE EJ-160E? I wouldlike a faster action than the 12's it came with. Yes those would work well on your EPIPHONE EJ-160E making it much easier to play.